Alexander Alexandrovich Romanov (Alexander III, 10 March 1845 – 1 November 1894), was Tsar of the Russian Empire from 13 March [O.S. 1 March] 1881 until his death on 1 November [O.S. 20 October] 1894. He changed some of the liberal laws made by his father, Alexander II. 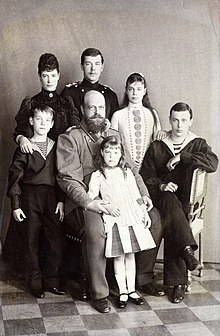 Alexander III had six children. His son Nicholas II of Russia became the next Tsar. This page was last changed on 29 January 2018, at 13:15.